It is said that if you cross the Brahmaputra river once, you will return again to cross it a total of seven times. I’ve done 3 and as I try to find out more about an Assamese textile, it seems that more trips are in store for me in the future. The textile at hand is from Assam and every day it reveals a bit of its story to me. I have just begun the journey of understanding it and will share the ‘jagruti’ or awakening of my vision with respect to this textile here. The dealer had not seen anything like this before and neither have I. But I do not count. The dealer has obviously seen more material pass through his hands than I have – so I am slightly intrigued by the fact that he had not seen a piece like this before. And so eventually after a few weeks, I get the cloth and begin my journey. It is an old piece of silk in a rectangular format with some weaving and some embroidery and is roughly 2.5 m x 0.8m. The field is filled with inscription from top to bottom aligned vertically. 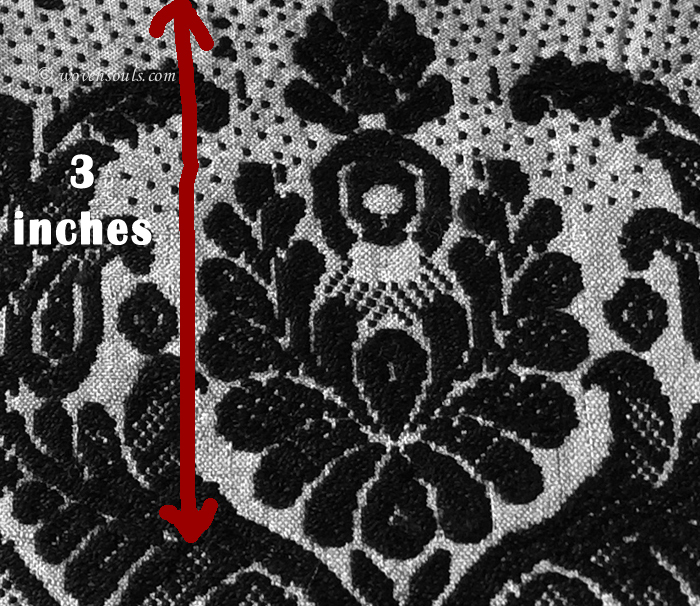 The ends and the edges have embroidered figurative motifs. 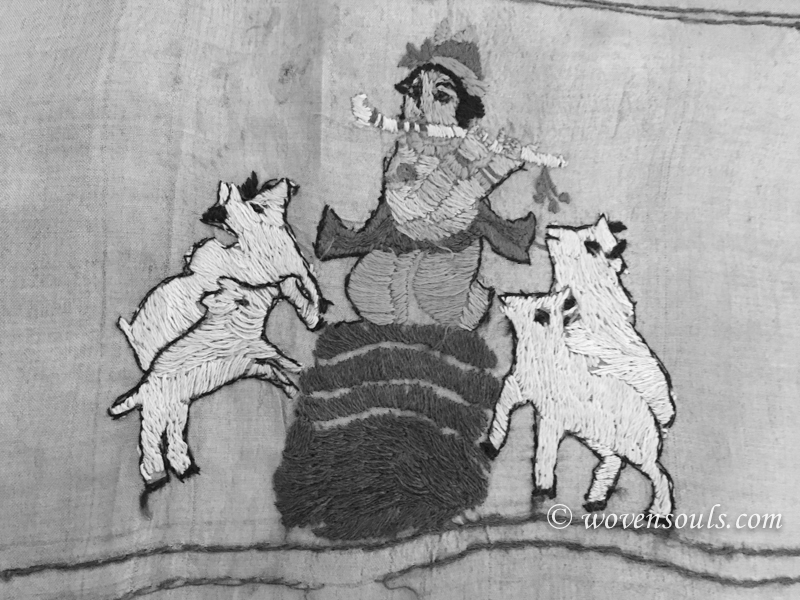 A closer look at the embroidered figures reveals that these are images of Krishna and Ram. Most scenes are from the life of Krishna and a few are from the life of Ram. I have chanted this rhythm hundreds of times myself. In my childhood at the age of 6-7, when I’d complain to my grandma that I was bored she would ask me to repeat a chant as many times as I could .. 100 times and then 200 times and so on. It did keep me busy but not any less bored. This refrence to Krishna & Ram confirmed the textile’s Hindu roots. The script had narrowed down the geography to the North East. Assam and Manipur are the two states that have large Hindu populations in the North East region and so the Hindu origin narrowed down the source location further. Later, it was confirmed by our Assamese-literate housemaid that the script is indeed Assamese! The textile was revealing itself to me, one aspect at a time ….Using the clues of ‘Krishna’, ‘Ram’, ‘Silk’, ‘Weaving+Embroidery’ and ‘Assam’ I began searching. And once again I marveled at the internet – google archives in particular for documenting old books that are no longer bound by copyright issues. Along the journey of fact-finding I stumbled into the cultural history of Assam, the impact of that on its arts, its place in the silk route and learned about the many textiles that share the cultural roots with this particular textile. Plagued with feelings of ‘how little I know’ and burnt out eyes, I plodded on, scampering through the literature available on the subject. 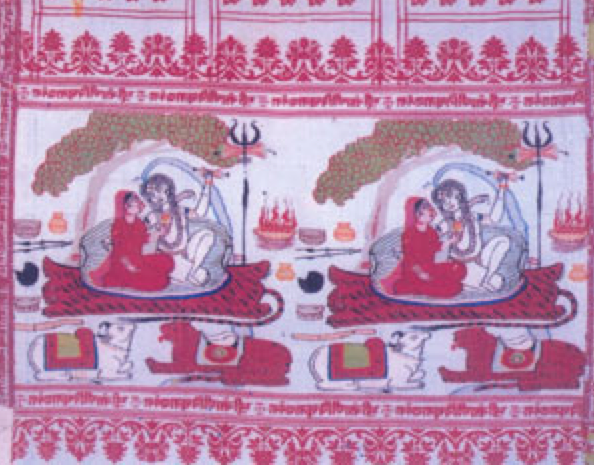 What a wonderful lead-line this textile provided in discovering the cultural history of Assam! 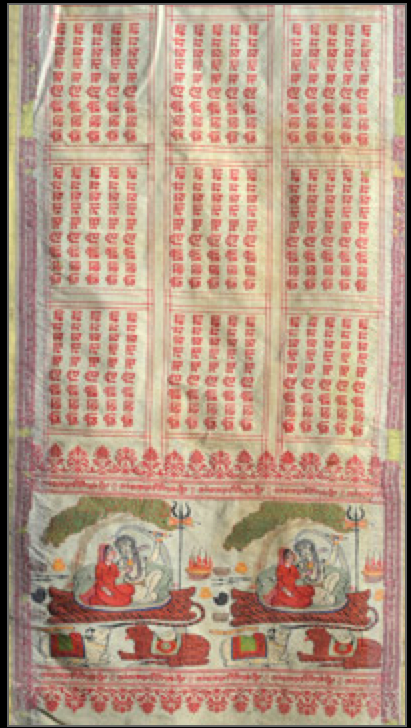 I read about the “Vrindavani Vastra” woven during the lifetime of Sri Sankardev, in the 16th century was a tapestry 120 cubits long and 60 cubits broad. It depicted Krishna Lila scenes and was therefore named the Vrindavani Vastra. Lost in Cooch Behar and then rediscovered years later by an Englishman in Tibet, it is now in the V&A museum London. Technically, the word ‘Vrindavani’ means ‘of Vrindavan’ (the birthplace of Krishna and hence always associated with Krishna) and ‘Vastra’ means a ‘garment’. 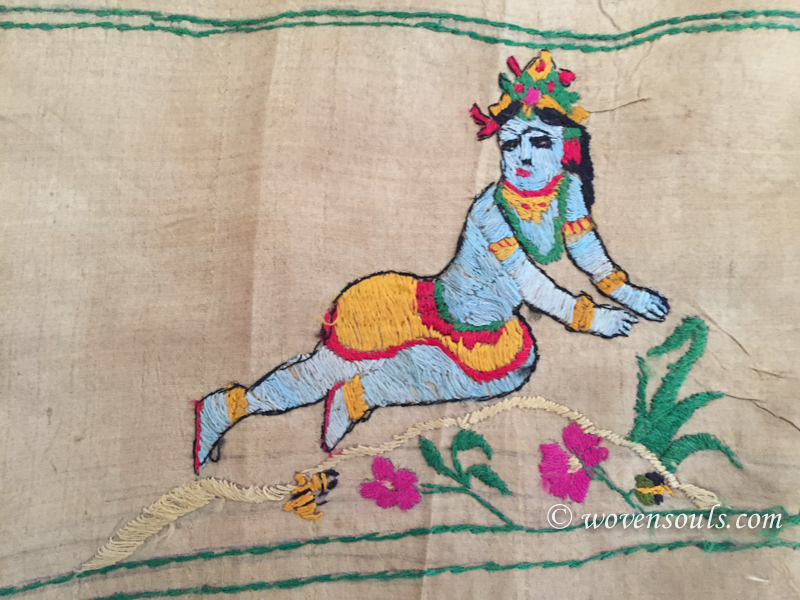 This is the name not only of that particular 16th century textile but also describes the category of textiles that have a Krishna-centric devotional purpose. Further, since Krishna is an avatar or reincarnation of Vishnu – one of the 3 primary Gods – Brahma+Vishnu+Shiva this may also be described as Vaishnavite or associated with Vishnu. Although the very interesting V&A Vastra textile is different from mine in almost every way, it is the fruit born of the same root i.e. 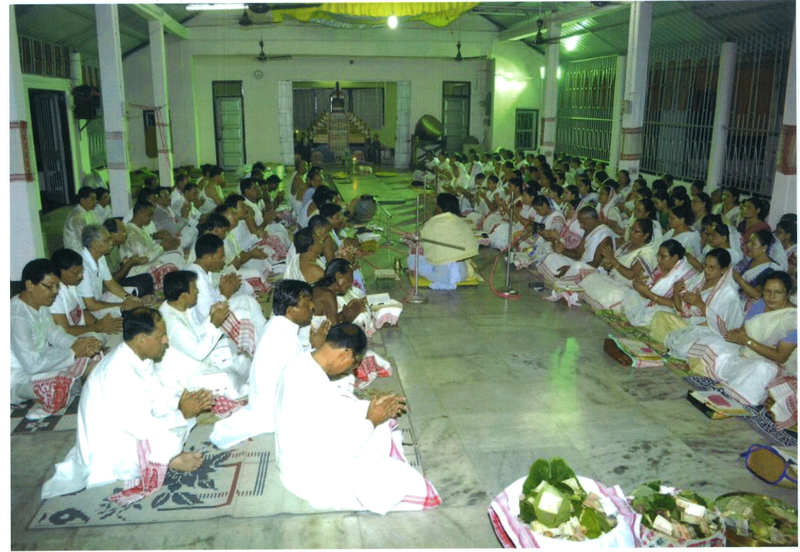 the Vaishnavite religious movement that Assam went through in the 16th century. 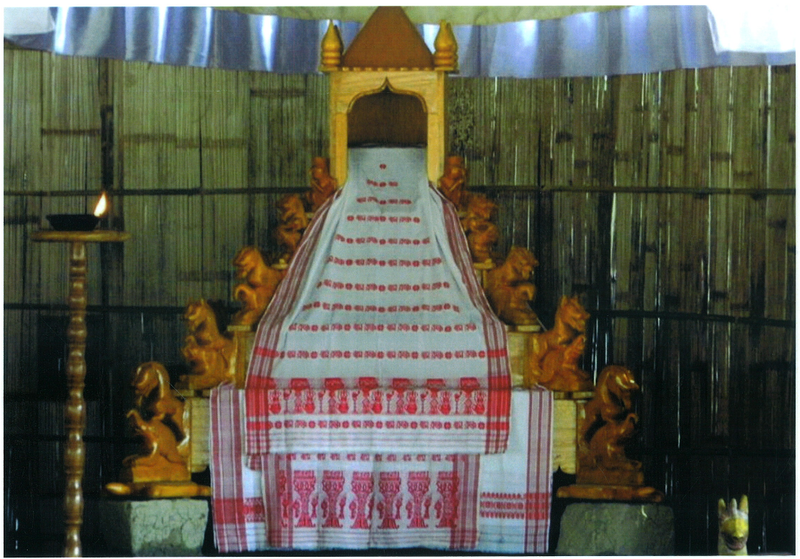 At this point I am certain that this is an Assamese Vaishnavite Kapor (cloth) or Vastra (garment). I read on and find more confirmations. Vishnu always carries his four symbols in his four hands: a) white conch shell b) rotating disk c) golden mace and d) lotus flower and we see that in our textile between the sets of text. 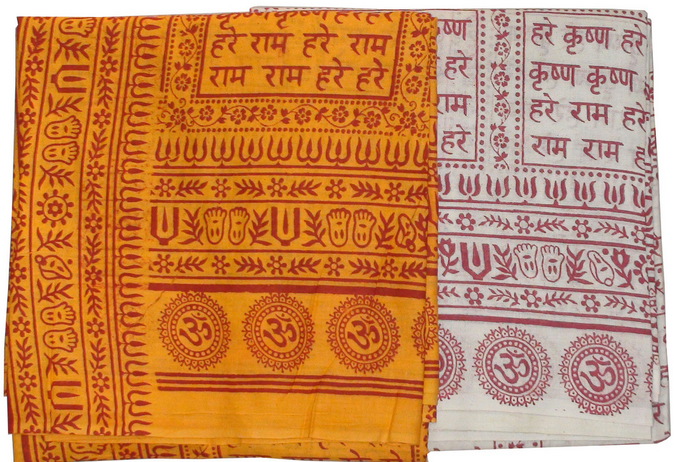 Priest Cloths worn by Vaishnavites have motifs of the feet of Vishnu and the lotus-shaped throne of his wife Laxmi and often have inscriptions of the prayer chant of the incarnations or avatars of Vishnu – Krishna and Ram. A printed example with devnagri script ‘Hare Ram Hare Ram Ram Ram Hare Hare || Hare Krishna Hare Krishna Krishna Krishna Hare Hare confirms my Vaishnavite Textile theory. The similarity of the National Museum cloth with our cloth is striking and I feel like I am almost there. But because of this difference of horizontal versus vertical text I am not satisfied and search some more. 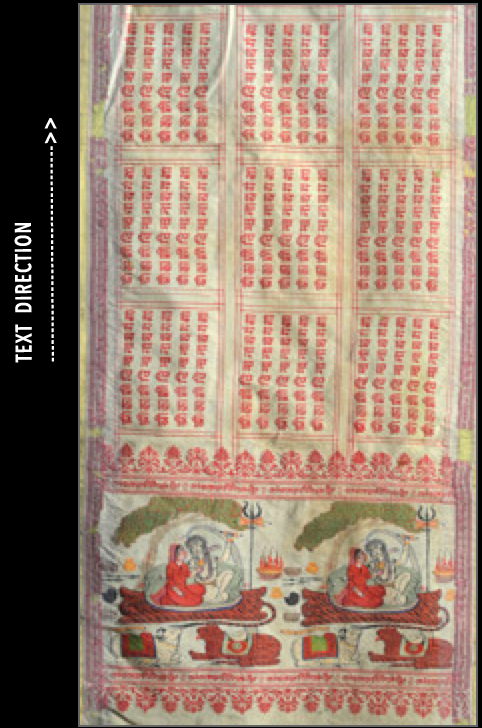 The unidirectional embroidery of the text leads me to think that what I have is an altar cloth – used to cover the idol or the altar when it is not time for ‘darshan’. Too often on my travels, while visiting ancient but active temples at odd times, I have been faced with such a curtain unable to view the god or goddess. I’ve never thought about these curtains as ‘textiles’ until now. Not knowing which direction to pursue further – I look for information on the textile art of Assam and find out about ‘loom embroidery’ work. What is that!!! Will need to read more, search more, see more to understand the technicalities of the craft! 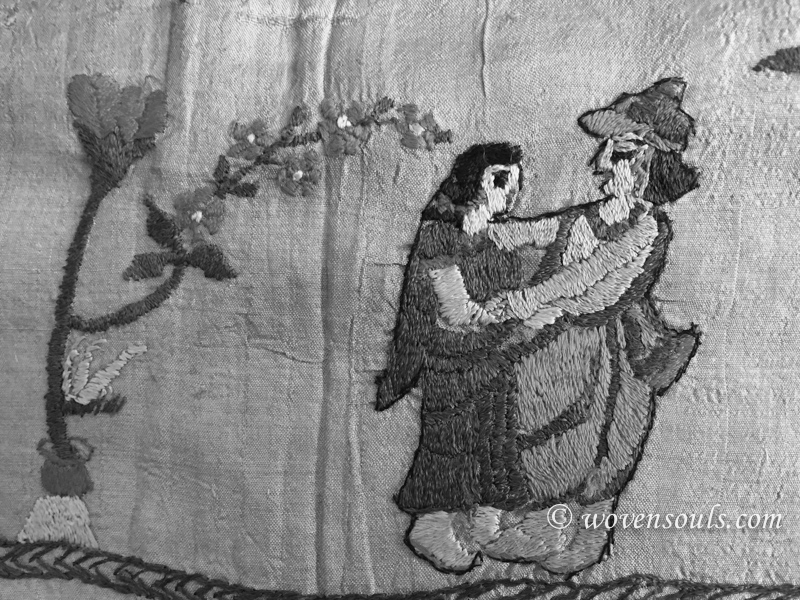 It has been the practice of women to embroider garments and cloth. For their embroidery, they use coloured threads, muga, like red, white, black, yellow and green of the colours some were evidently mixed colours or Misravarna like Kach-Nila, Gaura-Syama, the above colours are still popular in Assamese loom embroidery work. “The illustrated Namawali shawl with inscribed field became popular around the 15th-16th century in Orissa, Uttar Pradesh, Bengal and Assam. 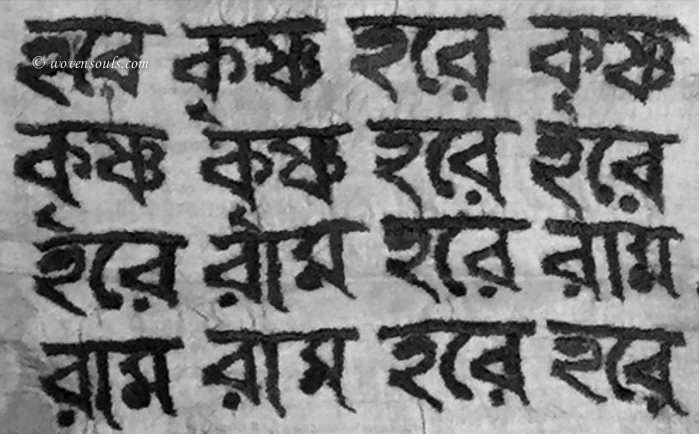 A lot of silk woven shawls or chaddar (drape covering) with repeated invocation of names in Bengali script have been found. I am satisfied. Finally I know what it is that I have. Finally I know what it is that I need to search for and what words to use to formulate questions when searching for more answers. It feels good not to be completely blind anymore! Of course even with sight, it is uncertain whether I will find much to look at on the net / in literature / in museums. This has been a very enjoyable journey to Vrindavan and Assam. a) finding out the narrative details of each of the scenes shown – some I recognise but others will be familiar to people who are well-versed with the Hindu epics. b) investigating the piece as a textile remains – age, dyes, craft technique etc. One small step at a time… because the journey of discovery is, after all the real reward! This entry was posted on October 29, 2015 by wovensouls in Art Kaleidoscope, Culture Kaleidoscope and tagged altar, altar cover, antique, Antique textile, antique textiles, antique textiles from India, art, Asian textile, Assam, assam embroidery, assam textile, Assamese, assamese textile, cloth, craft, culture, devotional, embroidery, ethnic, fabric, folk art, india, Religious, textile, tradition, traditional, weave.